Home *WhatsOn advice from editors Andrew Guile big idea Events Homefeature Linas Alsenas London Masterclass publishers Scholastic WhatsOn EVENTS What's the Big Idea? 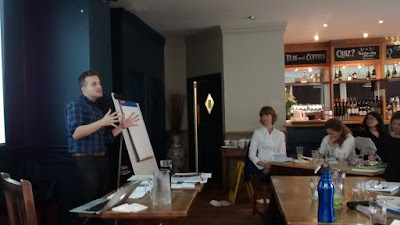 On Saturday 20th October, the fabulous Linas Alsenas, editor at Scholastic, gave up his time to chair a SCBWI Masterclass. Andrew Guile reports. With the course title posing the question, What’s the Big Idea?, I expected to hear a lot about ‘voice’, ‘USP’ and high concept ideas. And, yes, those were mentioned but we all learned so much more. As both an author and editor, Linas has been publishing from both sides of the fence and shared some amazing insights with a rapt audience about how publishers think. If we understand them, we have a better chance of ticking their boxes, right? 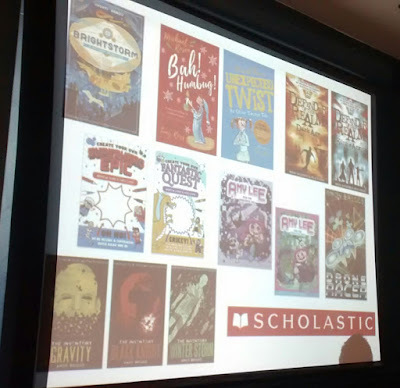 From advances to help with school visits, Linas shared his experience of the realities of publishing in today’s children’s book market. We learned Linas’s approach to the actual editing side of his job – classics like ‘show don’t tell’ but also some really insightful thoughts about where middle-grade stories end and young adult stories begin, both in terms of the age of the protagonist and the plot focus. Linas shares his experience of the realities of publishing. But editing is just one skill that a modern editor needs. Linas is kept busy in so many other ways. From talking to agents and scouts, going to book fairs and tracking sales figures to attending acquisition meetings and actually editing, time is often scarce for getting down to the business of reading submissions. Snatching time on the tube or train is his only chance which emphasises the importance of getting that first line, that first paragraph to be as engaging as possible. 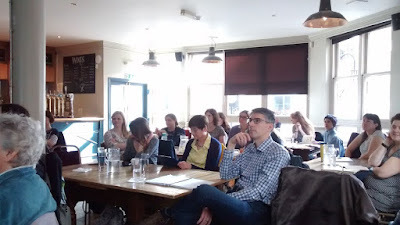 I’m sure that all those who attended came away with a much better understanding of what editors want and what might cause them to say ‘yes’ or ‘no’. Does your story fill a hole in their list shape? Have you captured their imagination with a punchy ‘X’ meets ‘Y’ pitch? What’s your unique selling point (USP)? Convincing an editor of where they might position your story and how they might pitch it to their own teams, and booksellers too, is vital. This is the key message that I took from the afternoon. Participants listen attentively to Linas's advice. We need to know who our readers are and have a clear vision of where we think our story fits in the current market. Then, we must ‘sell’ our story to an agent in a way that will persuade them they can ‘sell’ it to an editor so that they, in turn, will feel passionately about it and want to ‘sell’ it to their in-house teams and their boss, the publisher. Understanding how publishers operate helps us help them get our books published so that they can find their way into readers’ hands. Towards the end of the afternoon, in a really challenging exercise, Linas tasked table groups to come up with a one-line pitch, a two to three sentence elevator pitch and a longer (two to three paragraph) Amazon blurb for a story idea that we’d worked on together. Groups had to come up with one-line pitches, elevator pitches and an 'Amazon' blurb. This was a powerful way to make us all focus on pitching our story ideas in an engaging way. We looked at examples from other books first to give us some idea of how the professionals do it and got stuck in. The results, given the limited time available, were amazing. It was a truly inspiring afternoon that has helped me better understand what an editor really does and has hopefully given me a better chance of tailoring my work in progress to what they need. Finally, Linas generously offered to give feedback to anyone attending who wanted to send in their first chapter and covering letter. This sort of feedback is priceless — worth the ticket price alone. 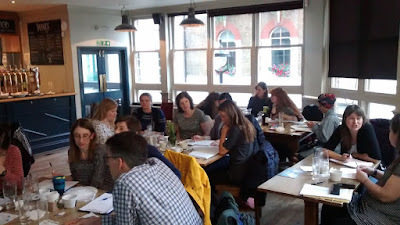 Thanks goes to SCBWI and, in particular, to SCBWI volunteers, Cath Jones and Alison Smith (aka Ally Sherrick) for organising such a wonderful event. 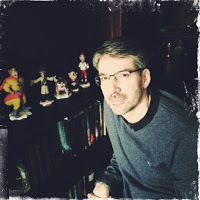 Andrew Guile has been a SCBWI member since 2016. His work-in-progress, Dragonspire, an upper middle-grade adventure, has come to life over the past two years with the help of the magical skills of the Golden Egg Academy. He lives in hope that the manuscript will start winging its way to agents in early 2019. It was a fab event and I await with bated breath for my feedback from Linas! Great write up BTW.